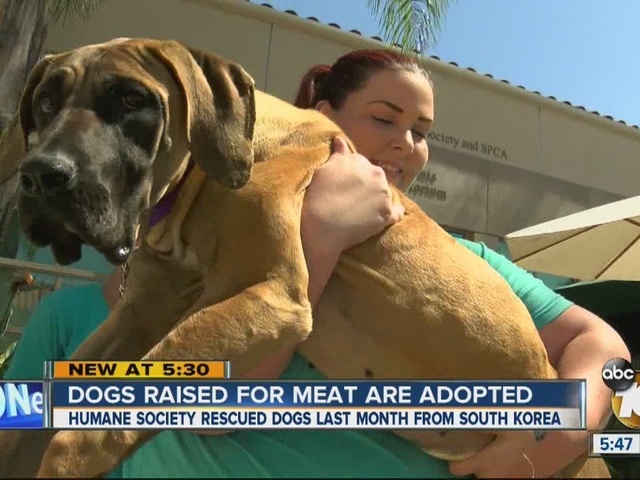 More than a dozen dogs rescued from the South Korean dog meat trade were adopted Thursday at the San Diego Humane Society. Ralph Gonzalez and his daughter Helena waited four hours to be first in line to adopt a mastiff they named Hero. "We're going to give her lots of love," said 11-year-old Helena. Less than a month ago, Hero was living in a South Korean cage waiting to be slaughtered for food, which is legal in the Asian country. "It's unbelievable a country so big was doing this," said Gonzalez. The Humane Society International rescued more than a hundred dogs in August. Twenty-nine of them were brought to San Diego for adoption. "Poor dogs went through a lot," said Gonzalez. Fifteen of the 29 were put up for adoption Thursday, and the rest will be available in the next few days. The San Diego Humane Society says anyone interested in adopting should check their website, www.sdhumane.org , regularly to find out which days they will be available.